Shot Snap is a game in which you gain a growing understanding of the world and how to navigate it. It messes with perspective. A lot. A puzzle game about... Growing Sakura. You have a hexagonal field and a few sakura buds on it. Use the Left and Right arrow keys to grow. Solve puzzles by connecting every stone! Plant Lab is a simulation game that lets you mess with the DNA of a plant. A love story 6 micrometers across. An action puzzle game about growing plants by rotating the planet toward favorable weather conditions. Release a part of yourself in order to gain the parts of others. This is a simple two button puzzle game. Press D to grow the ball. Press A to create a new ball. You control a plant by making it grow with the Z and X keys. Z grows the plant straight up. Swarmonian Explorer is a mixture of puzzle- and exploration-game. A cute virtual pet game called "Tamamystery". Use the two buttons on the screen to take care of your pet and grow it big and strong! "In the beginning" is a terraforming game where you prepare your planet for life. Growing bacteria using light and solving puzzles doing so. You're blind and completely paralyzed, except for one finger. In this game you grow a baby, develop it's brains and jumpstart its heart. This how life gets made. Give it a go. With two newborn twin girls my time is stricly limited, and therefore I had decided to skip this Ludum Dare. Note 1: Hold left or right to skip intro and directly start playing! You forgot about Beardum Dare the biggest and best beard growing competition. Now you need to grow a beard in the last minute. A simple sidescroller, controlled with two buttons only. Theme chosen: "Two button controls"
​Two people are lost in the desert. Will they survive the wilderness? The ultimate mold simulator! Devour food! Grow! Devour more food! Fight! Devour EVEN MORE food! As an octopus, juggle sushi rolls over the Sushi Pit to serve them to customers! What high score can you get? Grow your line to reach the goal. With 24 puzzles, containing a variety of mechanics, this should keep you busy for a while. You control a snake, whose only goal is to eat as many plants as possible before dying an inevitable death. The Princess has been kidnapped by the evil Rigor Mortis. It's up to you, Sir Bouncealot to rescue her and bring justice to this world! Grow a botnet (https://www.techopedia.com/definition/384/botnet) by solving cypher logic puzzles and infecting computers. Floppy Frog! A silly physics "platformer" game, I just went with the "Two Button Controls" theme for this one. 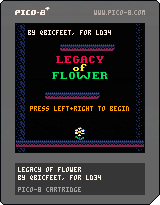 A game tangentially related to Growing, with 2 button controls. You control a car that auto-accelerates and you only have two-buttons to control it! Destroy enemy Chaintanks and collect their scrap to build the largest Chaintank possible while under constant attack. A Simple Puzzle Game inspired by The Legend of Zelda's Ocarina! Controls on start screen of the game. ATTENTION LINUX USERS: You will need love2d 0.9.0 or higher to run this game! A simple little game with two buttons where you dodge falling blocks. Get all rabbits and grow a good amount of grass to go to the next level. Discover who is Heinsenberg, who you are. And the most important question: where is Alice? Roll around. Inflate. Collect the things and the other things. It's an NMcCoy game, so if you know what to expect from that, expect it. Here it is! A platformer that uses only 2 buttons! Now, you might ask "But JatlBee, why'd you do that? isn't that really clunky?" As the Bargain Bonsai shop owner, it is your quest to have the BEST DAY EVER. Join Clara Stirzaker, adventurer and treasure hunter, as she explores the Crypt of Time in search of ultimate power. Crashteroids is a 2 button-control space growing game with the objective to collect all the aliens from the planets and get to safety. A game by blackbird806. Made in 48h for the Ludum Dare #34 themes were : growing, two buttons controls. Grow to infinity and beyond! But watch out, there are all kinds of hazards along the way. Kowloon Walled City was the densest place in the world. In Griffin Card you play different number cards to give your pet Griffin the power it needs to defeat the evil growing tree creature. DON'T LET THEM PUSH IT!!! Both themes, grow a fruit into a given shape. Space to grow fruit cells. Test your ability to react to two different streams of targets in this simple but challenging game. 2Fight is a fighting game that only uses two input buttons. Use these buttons to create combos and fight the enemies. I only used "Two button controls" as a theme. Arcade action on the high seas! Left click to use your pistol.